When’s The Best Time To Go To Kyoto? What’s the best time to go to Kyoto? What are the most interesting seasons? What’s the weather like in Kyoto in each month? When are the best festivals in Kyoto? Read on for our comprehensive guide. The best times to visit Kyoto are October/November (fall) and March/April/May (spring). You can visit Kyoto at any time of year because the weather is temperate. Summer (June/July/August) in Kyoto is hot and humid. Winter (December/January/Febuary) in Kyoto is cold. January tends to be clear and cold. It rains or snows a few times during the month. The snow usually doesn’t stick. Most businesses are closed from December 29th to January 3rd for the shogatsu (New Year’s) holiday. For the rest of the month, things are quiet and uncrowded so this is a good time to visit. 1, 2, 3 January: Hatsumode (first shrine visit of the New Year). Popular spots include Heian-jingu Shrine, Fushimi-Inari-taisha Shrine and Yasaka-jinja Shrine. 15 January: Toshiya (Archery Contest): Famous archery contest at Sanjusangen-do Temple. Winter continues into February. It might rain or snow a few times during the month, but the snow doesn’t usually stick. This is a good time to visit if you don’t like crowds. 2, 3 or 4 February: Setsubun Matsuri at Yoshida-jinja Shrine: A fantastic fire festival is held at Yoshida-jinja Shrine on Yoshida-yama, the hill just east of Kyoto University. The fire starts just after nightfall. Don’t miss this one! It warms up nicely in March. It might be cold, cool or warm during March, so be prepared for anything but hot weather. This is a great time to visit. In mid-March the plums blossom and in late March, the cherries usually start blossom. Most of March is uncrowded, but the last week tends to be busy with domestic tourists. Mid-March: Plum blossom viewing: Top spots to view the plums include Kitano-Tenmangu Shrine and the Kyoto Gosho (Imperial Palace Park). Spring arrives in earnest in April. The first 10 days of the month are the busiest time for sightseeing and the city can be packed. The cherries usually reach their peak during the first week of April. Weather tends to be warm, but be prepared for the odd cold day and cold evenings. The second half of the month tends to be uncrowded and lovely. Early April: Hanami (cherry blossom viewing): Top spots to see the cherries include Maruyama-koen Park, the north end of the Kyoto Gosho (Imperial Palace Park), the banks of the Kamo-gawa River, Kyoto Botanical Gardens (Kyoto Shokubutsu-en), and Gion’s Shimbashi district in the evening. 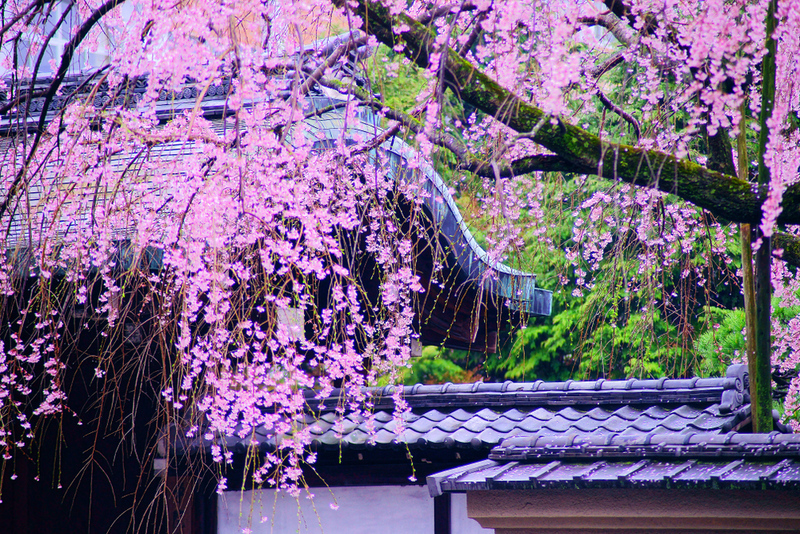 See our comprehensive guide to cherry blossom season in Kyoto. May is arguably the most beautiful month in Kyoto. It’s warm and there are many clear days. Lots of flowers bloom and the new green of spring is lovely. Best of all, it’s not particularly crowded. First week of May: Golden Week holiday: Most Japanese workers are on holiday. Many sightseeing spots are crowded and hotels are expensive at this time. 3 May: Yabusame (horseback archery) at Shimogamo-jinja Shrine: From 1pm to 3:30pm, a horseback archery competition is held in the tree-lined arcade south of the shrine’s main hall. Don’t miss it! 15 May: Aoi Matsuri: One of Kyoto’s biggest festivals, this festival involves a procession from the Kyoto Gosho (Kyoto Imperial Palace) to Shimogamo-jinja Shrine via Kamigamo-jinja Shrine. The procession leaves the palace at 10:00am, arrives at Shimogamo-jinja at 2pm and at Kamigamo-jinja at 3:30pm. June is another good month to visit. It’s usually warm but not hot. There are many sunny days, but toward the end of the month, the rainy season begins. However, it doesn’t usually rain every day (afternoon showers are common in the rainy season). 1, 2 June: Takigi No: Performances of No drama are held at Heian-jingu Shrine in the evening. It’s an atmospheric spectacle. The rainy season extends into July and it is usually hot and humid with frequent rains. Still, it’s possible to travel in Kyoto in July and it’s not crowded. The rainy season ends toward the end of the month, and then it becomes sunny, hot and humid. 17 July: Gion Matsuri: The biggest festival of the year. On the morning and afternoon of 17 July, huge festival floats are pulled through downtown Kyoto. On the three evenings before the procession, the streets of downtown are closed to pedestrian traffic and people mingle and party among the decorated floats while dressed in yukata (cotton robes). Don’t miss it! August is generally very hot, humid and sunny. If you’re prepared for the heat, this can be a good time to travel because it’s not crowded and there are lots of things going on. 16 August: Daimon-ji Fire Festival (Daimon-ji Gozan Okuribi): Starting at 8:00pm, huge fires in the shapes of ideograms are set alight on mountains around the city. The fires start at Daimon-ji-yama, the mountain just above Ginkaku-ji Temple. You can watch the fire from nearby Yoshida-yama or from the Kamo-gawa River, among other spots. September is an excellent time to travel in Kyoto. It’s usually sunny, hot and humid at the beginning of the month, moderating to sunny and warm at the end of the month. This is low season for tourism and hotels can be a bargain. October has some of the best weather of the year: sunny and warm days are the rule, with cool evenings. It’s a very comfortable time to travel. At the very end of the month, the leaves start to change color. 22 October: Jidai Matsuri (Festival of the Ages): A parade of people dressed in period costumes marches from the Kyoto Gosho (Kyoto Imperial Palace) to Heian-jingu Shrine. 22 October: Kurama-no-Himatsuri (Kurama Fire Festival): In the village of Kurama, a short train ride north of Kyoto, young men dressed in loincloths carry huge flaming torches through the streets. The festival starts at dusk and climaxes around 10:00pm. November rivals May as the best time to travel in Kyoto. The weather is usually warm or cool and sunny skies predominate. Kyoto’s famous fall foliage is lovely during mid- to late November. Winter sets in in December, but the skies are often clear. The temps vary from cool to cold in the day, with cold temps in the evening. If you have an aversion to crowds, this is a good time to visit, but keep in mind that things shut down from December 29th until January 3rd. 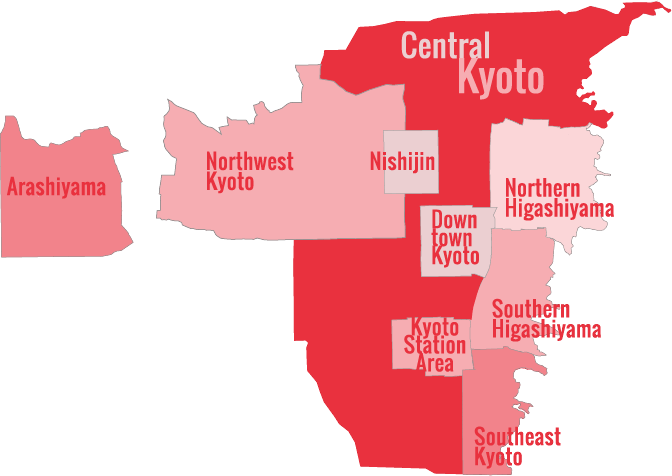 It’s also important to consider your hotel location for making the most of your time in Kyoto. See Where to stay in Kyoto for a rundown of the most convenient Kyoto districts for sightseeing. You might also find my recommendations for the best places to stay in Kyoto helpful. For more details on the festivals and events taking place in Kyoto each month, visit our Kyoto Festivals and Events page.